SO WHAT'S THE SECRET TO MAKING YOUR WEDDING A SENSATION? It’s simple - what your guests talk about afterwards!! Your Aunt's amazed expression when I make her family ring vanish only to have it reappear in a burst of flames!Your Father’s stunned face when I present him with a gift of his own watch! And your skeptical sister? I'll read her mind and steal the thoughts out of her head like she stole clothes out of your wardrobe... her jaw will drop! Moments like these guarantee your wedding will be the topic of discussion at dinner parties for years to come. SO WHY SHOULD YOU BOOK ME OVER THE OTHER GUYS? I’m a headlining comedy club act and hired to perform at hundreds of corporate events every year. Why? I mix eye-popping magic with hilarious comedy… without ever being offensive! So when I entertain your guests it’s a simple formula - make them laugh and then hit them with industrial strength magic. IT'S THE BIGGEST DAY OF YOUR LIFE SO ITS GOT TO BE PERFECT! It's simple -Your guest’s absolutely love my performance or it’s free! See how many other Magicians will offer you that and if they don’t, why not? I look forward to the possibility of entertaining you and your guests. Wishing you both every happiness in the future. 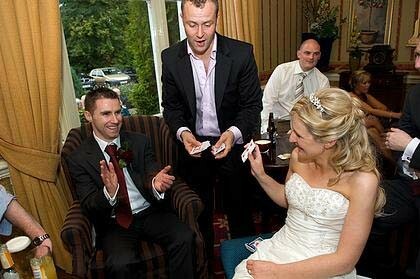 Jack Wise Magician & Comedian is a Magician from Dublin servicing weddings throughout the local area including all over Ireland & England. 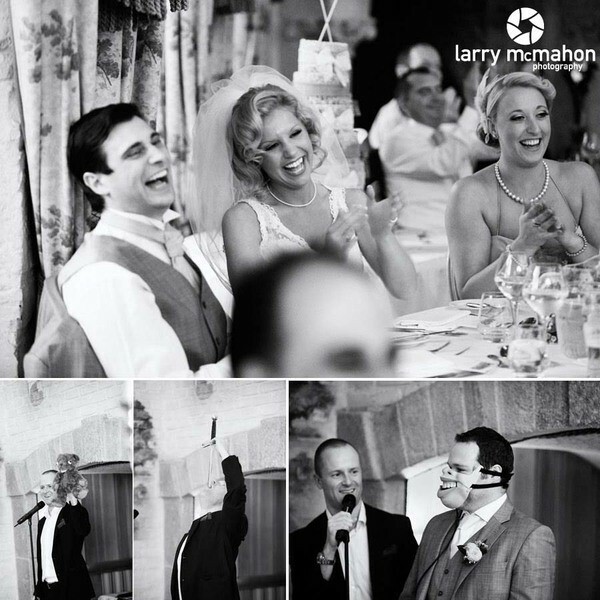 Jack Wise Magician & Comedian is a brilliant entertainer that has been part of the corporate entertainment and wedding industry for 17 years specialising in magic, comedy and ventriloquism. Jack Wise delighted all our guests, ranging in age from 2 to 82, with his magic, wit and humour on our wedding day in April 2019. He helped to create a relaxed and friendly atmosphere and engaged positively with everyone there. We would warmly recommend him to others. 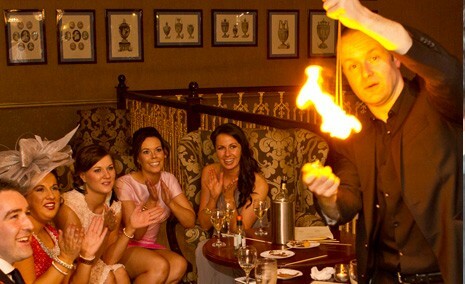 We found him professional, flexible and reliable in our dealings with him and on the day itself both his close magic and after dinner performance were superb. Jack wize preformed at out wedding. He had everybody in stitches laughing. Was definitely one of the highlights at our wedding. Thanks very much for everything would definitely recommend. Jack was brilliant from start to finish! Both kids and adults enjoyed every minute. Magic tricks were brilliant and funny and jacks stage act left me with a pain in my face from all the laughing! Every person at the wedding enjoyed it and are still talking about how good it was. Really glad we decided to contact Jack, really nice man and was great to have something different at our wedding that left people talking about how good it was! Would definitely recommend Jack, you won’t regret it! 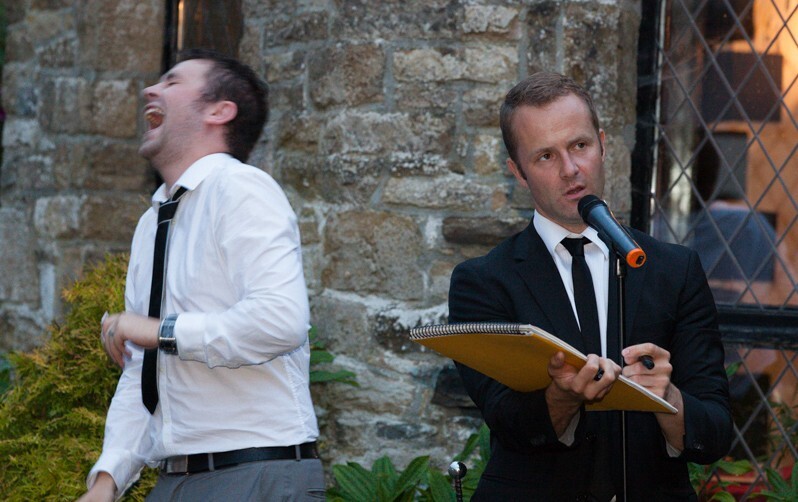 Jack wise came to our venue and entertained our families and friends on our wedding day, he was amazing and hilarious. Our guests are still talking about him. He really added that extra touch that made our day a really memorable one. 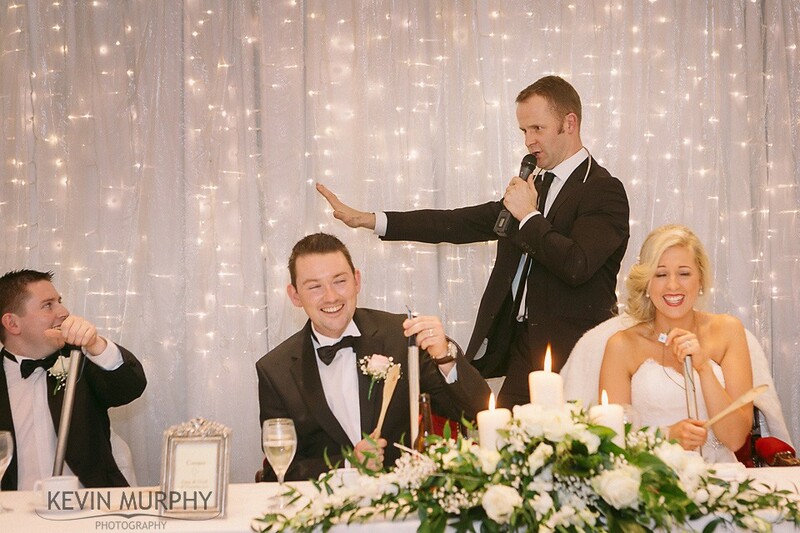 We booked Jack for our wedding in Kilronan Castle 7 months ago. His performance really was the cherry on the icing on the cake of our perfect day. It was like getting a 2-for-1 deal with a magician and comedian in one. He was loved by all our guests. From our young nieces and nephews to our older guests and everyone in between, everybody was entertained. When we reminisce with guests now about the wedding, Jack’s performance is the main part that everyone remembers. Jack was really great to deal with before the wedding and on the day itself. We would definitely recommend him for your big day. Jack's act was loved by the attendance. He added an extra dimension to the event that created a fantastic mood among the guests. Jack Wise is a must have for your wedding!! Our guests are still talking about him! We had never seen Jack perform, just checked out a couple of YouTube clips and decided to book him. He did not disappoint. We are so happy with everything. He was so so funny! Had all our guests in stitches! And gave me a pain in my face from laughing!! My brother will NEVER live the mask down. We booked Jack as our wedding entertainment for our wedding in February. Having only seen his You Tube videos prior to the wedding, we were a little bit sceptical. However he did not disappoint one bit, in fact, he was amazing. All our guest thought he was fantastic and really got everyone going with his after dinner performance which immediately got the night off to a good start. He was without doubt the highlight of the day and is a lovely guy to deal with. I would highly recommend him, as would our 260 guests. I booked Jack Wise to perform his wedding Show as part of a family event. I've used Jack for many events over the last 14 years and he has never failed to disappoint! The whole afternoon was fantastic from start to finish and every time I think of it I find I am chuckling away to myself! Our guests felt the same way! We were thoroughly entertained and I was literally inundated with text messages and calls afterward from all our friends telling us how much they had all enjoyed it! I cannot recommend him highly enough! Jack was absolutely fantastic. 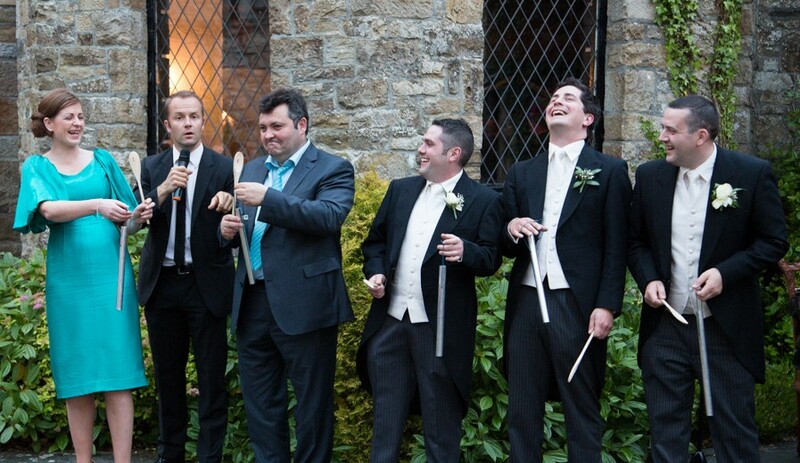 He had all the guests amused and in stitches laughing from the moment he started. The wedding guests couldn't get enough of him and have raved about him since the wedding. Highly recommended without a doubt. Thanks again jack you helped make our day. The guests were raving about Jack for weeks after the wedding!! They really enjoyed it! And were very impressed!! Also we really enjoyed the tricks we got to see!! As we were busy with our photos ; But Jack made sure there was time for us to aee hia best tricks. Overall very entertaining and funny!! Many talents rolled into one and we were very happy and would recommend him. Just wanted to say thanks a mill again!! We booked Jack after seeing him at Ballymagarvey Village. His ventriloquism with the best man was hilarious. We also went to see him in The Laughter Lounge before paying the deposit to make sure he wasn't a one hit wonder and he was great there too. My big day isnt till next June but I told him Id give him a review after seeing in The comedy Club .. Double thumbs up Girls!!! Cannot recommend Jack Wise highly enough. We had read comments on reviews saying that everyone was talking about him the day after their wedding - this is so true! He was the highlight of the day for us and our guests. Best value for money! It's so worth seeing photos and video clips of our guests in tears laughing! You will not be disappointed! It's a money back guarantee! Cannot recommend Jack highly enough. All of our guests were talking about how brilliant he was for weeks after our wedding. 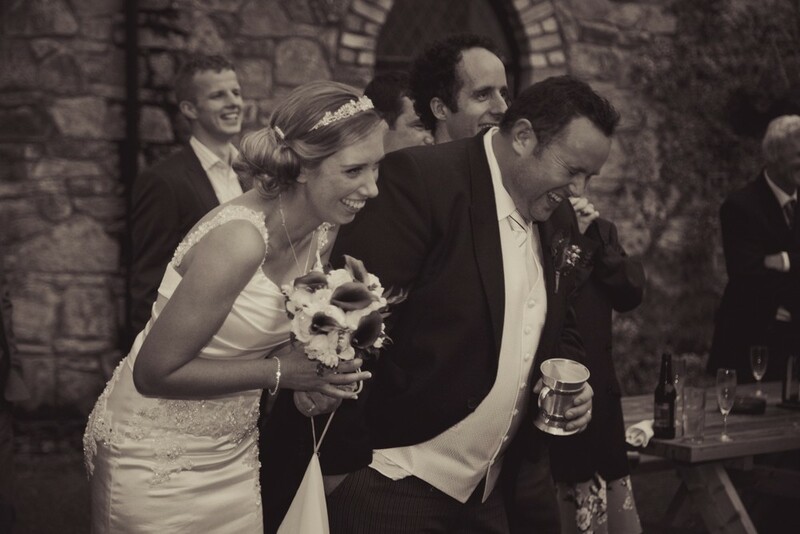 Hi Jack we just want to say a massive thanks to you for entertaining our guests at our wedding. You were brilliant, so funny. Everyone is still talking about you. 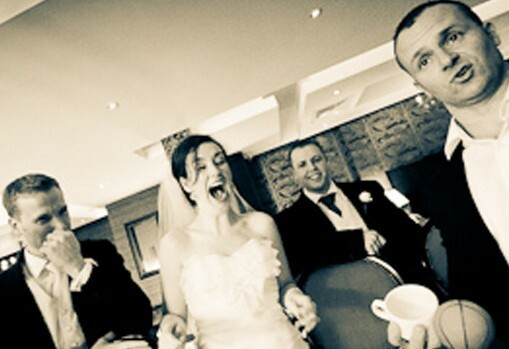 We would highly recommend you to people looking for entertainment with a difference for their wedding. Thanks again Jack. Hi Jack, Thanks so much for performing at our wedding. 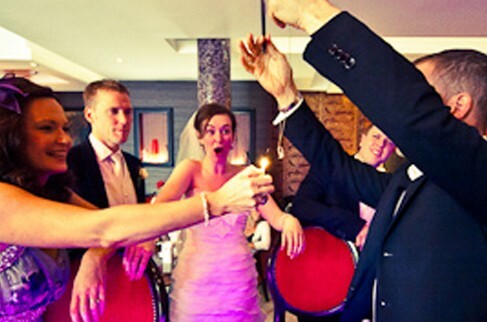 We looked at loads of Magicians websites and we are so glad we went with you! The guests are still talking about your magic but the bit they raved about was the ventriloquist thing you did. It was sooo funny! Thanks again for making our big day so much fun. All the best. Hi Jack, I just wanted to drop you a line to thank you for the fantastic performance on our wedding day. You were a big hit with the guests so thank you very much and all the best. Kind regards. Hi Jack Woooooooo Jack you truely were amazing, so so so glad I booked you. I dont think you realise how unreal funny you are in a classey way. You made our wedding so special & so FUNNY Thanks again. Jack - Thanks for filling our wedding reception with Magic - you were sensational. A surprise to all our guests who had so much fun and were mesmerised. You were that special ingredient and we still have our card with both our names on as a memory - you are 'Magic'. Thank you so much. Hi jack had fantastic day on our wedding loved having you there all the guests are still talking about you would definitely recommend having you thanks so much. Wedding Ellen & Willie 12 Dec 2012 Red Cow Hotel Hi Jack, I just wanted to say a big thank you for everything you did to make our wedding day such a big success last Wednesday. I have to say, for me, you were the highlight of the night.The guests were literally falling around laughing and that made me very happy. Again, a BIG thank you. Hi Jack, A massive thank you for making our ceremony so special. 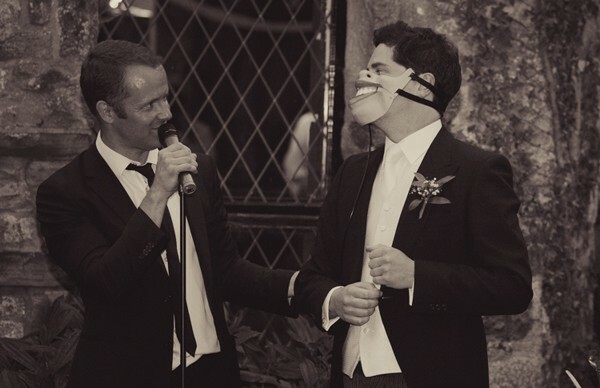 All the guests really loved you and the mask on James was the funniest thing I've ever seen! Thanks again. Jack Wise, what can I say, you exceeded our expectations. Thank you so much for making our wedding the best crack ever, I will be recommending you at every opportunity. Great day with great entertainment. I hope we meet again.